The wildwood design department is staffed with experts who provide full-service planning and implementation of commercial and residential kitchen systems. Our designers will maximize efficiency and productivity by creating a functional and high performance kitchen layout, increasing your return on investment. Wildwood maintains a large selection of affordable stock plans as well as custom kitchen designs. Wildwood’s oven design services offer a wide array of design features; Pizza ovens, BBQ’s, Counters, sinks, refrigerators, wet bars, beverage dispensers, wood storage, seating areas. Our designs incorporate various options of finishes to give the client a preview of the look and feel for the space prior to construction. This assures a beautiful, well designed outdoor kitchen for the home or the restaurant! Photo-realistic 3d kitchen design renderings enable you to see & feel how your layout will look before you build it. 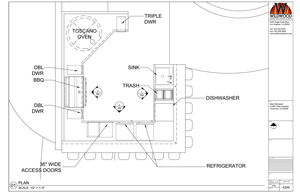 From these detailed design drawings, contractors can easily prepare construction budgets. – consideration of sustainable systems such as grey water collection and solar-powered equipment. Our design modification service allows you to modify any of our kitchen plans to suit your family’s specific needs. Plan modification is fast, easy, & cost-effective, and will allow you to create your dream kitchen.